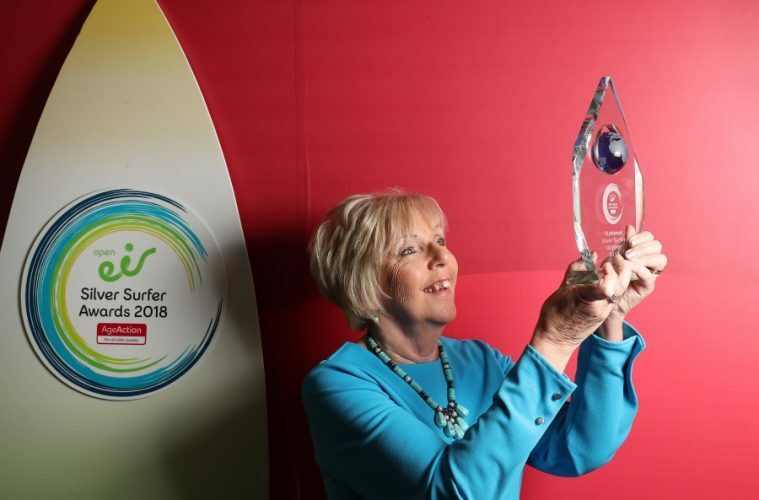 65-year-old Margaret Byrne from Tallaght, in Dublin, is the overall winner of the 2018 open eir Silver Surfer Awards. She was presented with her award at a ceremony this morning by well-known fashion designer, TV and radio personality Brendan Courtney. The ceremony was officially opened by Minister of State at the Department of Health with special responsibility for Mental Health and Older People Jim Daly T.D. In addition to winning the overall award Margaret also picked up “The Hobbies on the Net” award. Margaret (also known as “The Crafty Irish Girl” from her hugely popular blog) is a crochet, knitting and jewellery making enthusiast who uses social media to grow the craft community, and help keep hand craft skills alive. She has a Facebook page which she uses for sharing ideas and knitting patterns and she also provides online tutorials. Margaret is also a keen Pinterest user – with almost 1,000 people following her. She loves Twitter too, but Instagram is her favourite social media channel. On top of embracing technology to promote her chosen craft, she actively campaigns for survivors of mesh implant complications through the online support group “Mesh Survivors Ireland”, of which she is a co-founder. The group has grown to 250 survivors and has provided help to those suffering through meetups and support groups. Margaret uses Facebook, Twitter and email to reach out to younger generations who represent their older parents online, and who are suffers of mesh implant complications. Because of her online campaigning, Minister Simon Harris has agreed to carry out an investigation on the matter. John Church, CEO of Age Action, said: “We are proud to celebrate today some truly inspirational people. These Silver Surfers are challenging ageist stereotypes that the internet, social media and new technologies are only for young people. They’re not just doing so to improve their own lives but, in many cases, to assist their neighbours, support their communities and reach out to people who need help. We hope they will inspire thousands more like them to dust off the laptop or tablet sitting at home and get online. There is an entire world of information and entertainment waiting for them. Minister Daly also congratulated all the open eir Silver Surfer award winners and nominees, noting that Age Action’s Getting Started Computer Training Programme, along with eir’s commitment to provide the best mobile and broadband network to every household and business across Ireland, is instrumental in helping older people experience the benefits that technology can bring to their everyday lives. The Getting Started IT Awardwent to Tom Langan from Renmore, Galway. Despite his visual impairment, Tom has embraced technology across various devices and platforms. He now listens to audiobooks with Audible, converts printed text to speech or braille with KNFB reader, connects with sighted volunteers for visual assistance on Be My Eyes and uses blindness-aware GPS navigation platforms to go about his day. Tom also encourages those with visual impairments to become digitally apt and assists them with their devices and apps. Golden IT Award winner and retired RAF Pilot Gordon Lawson from Carrigtwohill in Co. Cork became interested in technology in his 80s as he was determined to not fall behind on the times. Now aged 99, Gordon uses the internet to stay in touch with friends, download music, bank online, deliver meals on wheels and write up the minutes of meetings in his role as secretary at the JW congregation in Carrigtwohill. Most importantly, he enjoys reliving his flying days by piloting flight simulators! Gordon’s enthusiasm for technology goes hand in hand with his enthusiasm for using it to help others. The Community Champion Award was presented to David Rowe from Sandyford in Dublin. David uses technology to observe planning applications for An Taisce, and frequently makes comprehensive, online, submissions on the Dun Laoghaire County Development Plan. At 98, David doesn’t shy away from using technology to make his voice heard and often contacts policy makers with detailed maps and suggestions. He contributes to the community magazine “Three Rock Panorma”, using his computer to author articles and design covers, and has edited eight books since his retirement. David also uses IT in a number of voluntary organisations. At 76, Mary Dunne is a role model for her friends at the Ardee Active Retirement Group, which now boasts of 80% internet usage amongst members. Mary is the driving force behind this uptake since learning how to use a computer in her late 60s. She books adventures online for her fellow pensioners throughout Ireland and across Europe and uses Pinterest to get inspiration for decorating her local church. She has set up a WhatsApp group to stay in touch with her six children and 16 grandchildren and has been known to give out tips for the Galway Races using the BetFinder app. Mary is an active promoter of internet safety and seeks to alleviate fears held by some older people around using the internet. For these reasons Mary has won the IT Enthusiast Award. Marie Hogan from Birdhill in Tipperary was the winner of the IT Tutor of the Year Award, which recognises the efforts of the hundreds of people across Ireland who volunteer with Age Action’s computer training programme, Getting Started. Since 2009 Marie has facilitated numerous training courses and one-to-one sessions and has fundraised to provide computers and computer equipment for the Milford Day Care Centre for the Older Adult. Marie has been working with one resident for the past three years who has faced many health obstacles. Thanks to Marie’s weekly tutoring this resident has a new found sense of independence through technology, as she communicates with her family and catches up on her favourite shows on the RTE player. Dominican College Griffith Avenue, Dublin was presented with the Schools Tutor of the Year Award. This is the first time in the history of the awards that a separate schools category has been included. The Dominican College has been tutoring older people since 2014 and in that time the school’s pupils and staff have gone above and beyond to help their older learners embrace the benefits of technology. VW Ware from Cork was awarded the Corporate IT Tutor of the Year Award. Since its first class in 2014, VM Ware has given over 1,500 hours of volunteering to the Age Action Getting Started programme and their team of volunteers have made a huge contribution to changing the lives of older people in their local community.